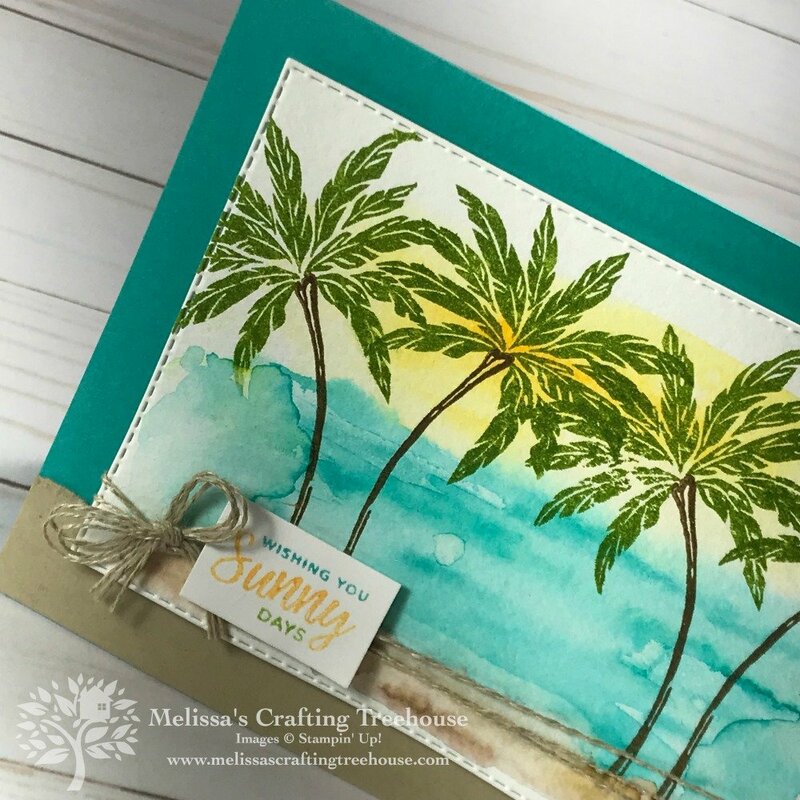 Today’s project features the Beach Happy Stamp Set and the Rectangle Stitched Framelits. Water coloring and the Omitting Markers technique are used. This project was CASE’d (Copy and Share Everything) from Tami Hewlett a fellow design team member for the Color Fusers Blog Hop. I demonstrated this water coloring project in my weekly Facebook Live event on 4/11/19. I changed my design in a few ways with some different layering, a different sentiment and one slight variation in the water coloring. The card on the left above uses water coloring in the same way that Tami did. For the version on the right, I added some water colored “sand” at the bottom. Click HERE to see Tami’s design. With water coloring, each time you do it, it will turn out different. If you look at my two cards and the one Tami did that will be very apparent! So in the close up below you’ll see that the sentiment is stamped in three different colors. 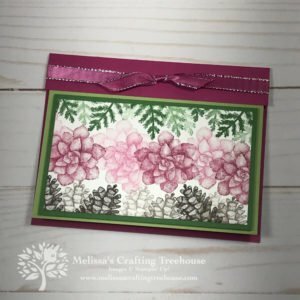 I’ve used Stampin’ Write markers and the Omitting Markers technique. To learn more about this technique, watch my video tutorial just ahead. This technique can be done in a few different ways and in the video I provide important tips as well. Here is the version that is more like Tami’s. I like how the water coloring turned out in this version a bit better. Again, each time you water color it will turn out different! 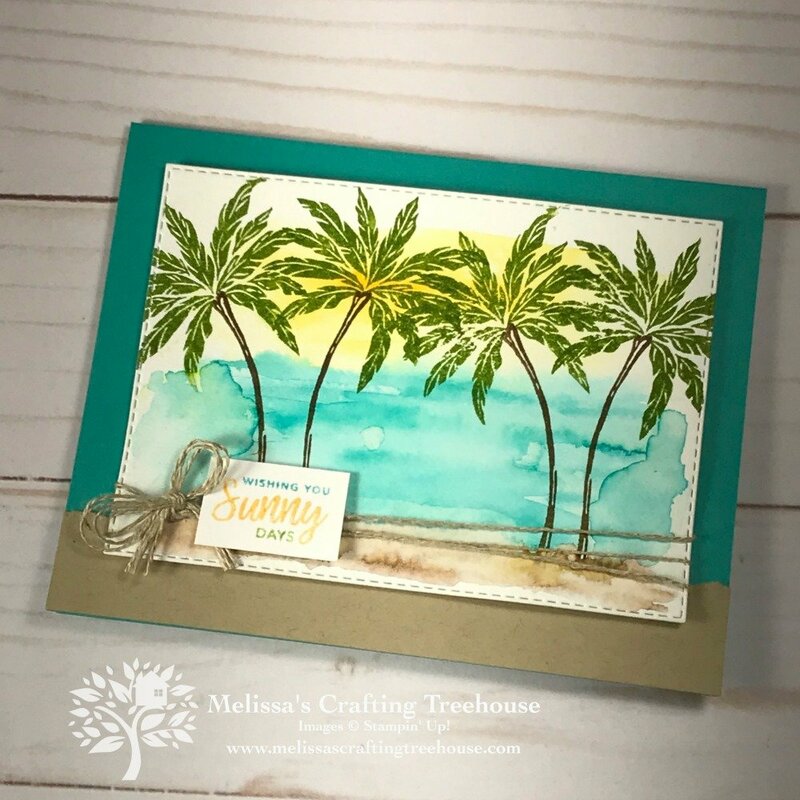 I hope you’ve enjoyed my project today featuring the Beach Happy Stamp Set and Rectangle Stitched Framelits! 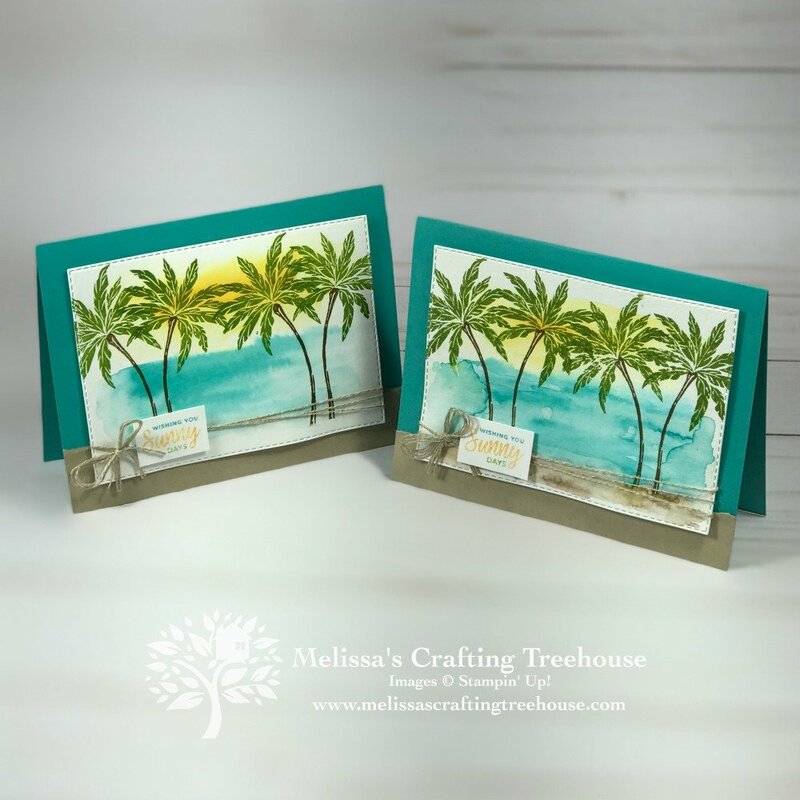 These products are both in the 2019 Occasions Catalog, which will be retiring on June 3, 2019. We will find out on Monday 4/15/19 what will retire and what will carry over from this catalog and from the 2018 – 2019 Annual Catalog. You’ll find a complete supply list and project dimensions toward the end of this post. If you love this stamp set and framelits I’d recommend you order them before 4/15. Once the retiring list comes out items can run out quickly! 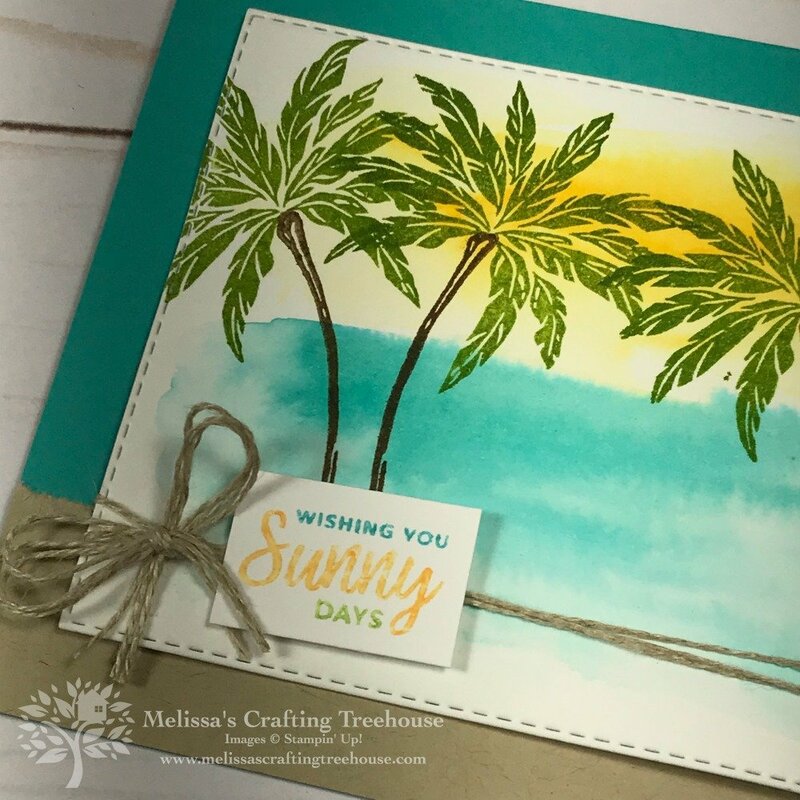 The 2019 Occasions catalog & 2018–2019 Annual Catalog Retire as of June 3, 2019. Once the retiring list goes live items can go fast! Get the items you love NOW before it’s too late! Check back on 4/15 to see the retiring list! 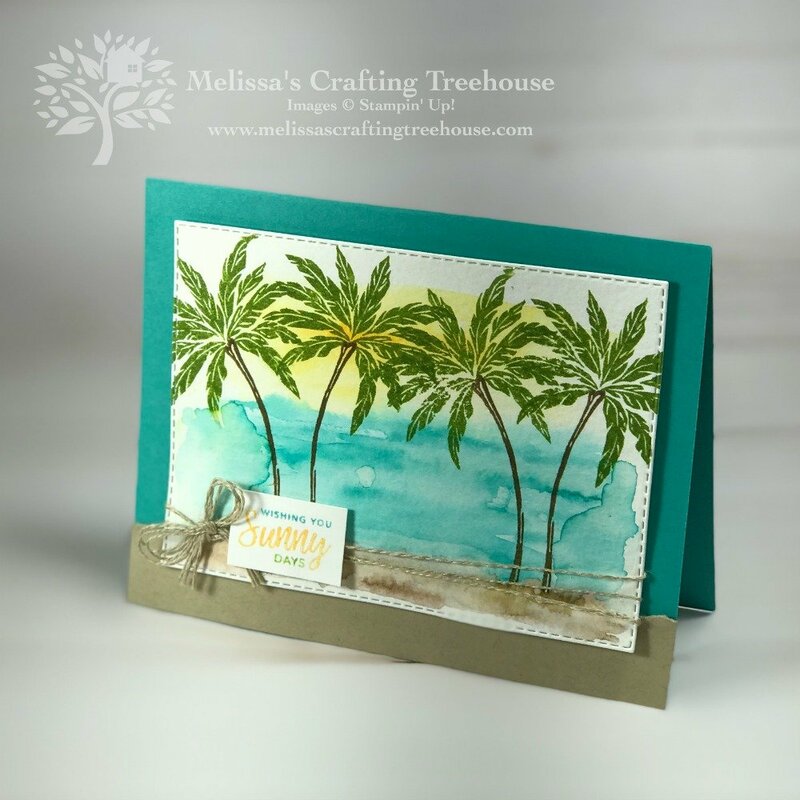 If you intend to place your Stampin’ Up! orders through me, I’d be happy to send you a catalog! “Taste of a Suite” Product Shares will available to preorder soon! Click HERE to check out my unique product shares. Click HERE to leave a comment and let me know that you’d like to be notified when more information is available. Use the text “add me to the product shares interest list”.